Generally speaking I'm not a huge fan of posting recent content from another blog, but I thought this was too good to pass up. Thanks for the 411 Erik! 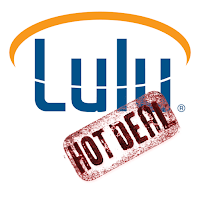 Lulu.com often has deals here & there. Usually something along the lines of an "ok" percentage off or free shipping. Right now they are offering 25% off and free shipping! Even though I had just payed good money for a PDF I couldn't ignore this sweet deal. All you have to do is use coupon code "LULURC" to get this deal. Usually you can only use coupon codes once, so make sure you figure out what you want to buy from Lulu before applying the code and finishing your purchase.